It seems that I was all alone in an apartment in New York city just a little while ago. Now life seems like it is bursting at the seams with a growing family. I always have company for a walk or a talk. Even my five month old baby appreciates a good stroll with Mommy in the baby carrier. “Aye” he goes, lifting up his chin and beckoning to me “hmmmm.” “Booo” I respond. When things are at their craziest, with a loudly bawling three year who just can’t understand why Daddy has to go to work each morning or a fussy baby who refuses to settle down despite what seems like hours of rocking, I think longingly of my small and quiet space that had a window box for herbs and a hand-embroidered coverlet with fat pink roses on my bed. 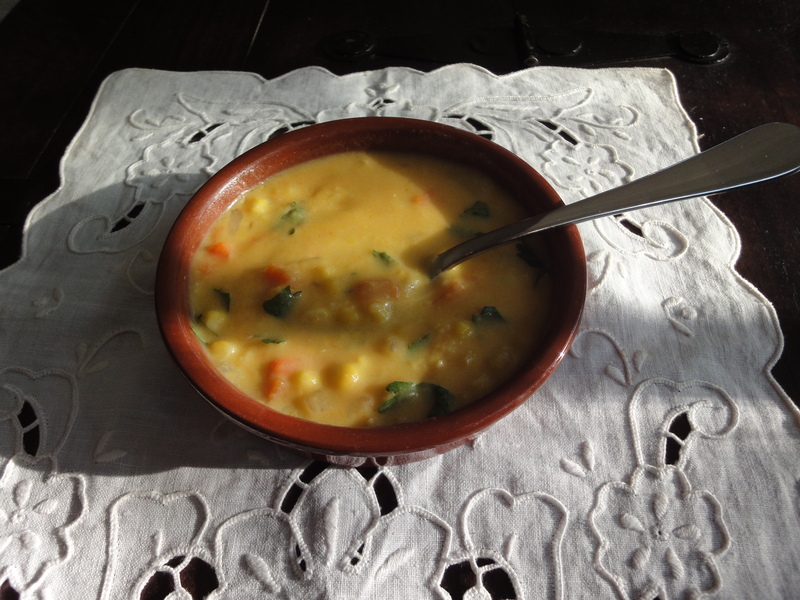 This soup, with fresh corn, carrots, onions, potatoes and garlic from the farmer’s market is simple and unfussy – no stock and no heavy cream, and quick, one-step cooking. It’s full of old memories such as the discovery of fresh summer corn at my local farmers market. I stand at the counter and run my knife down the sides of the bright yellow, succulent ears of corn and think of those empty swathes of time when I wondered when my life would change. The kernels are round and juicy, and yield a sweet crunchy taste with a burst of corn milk in my mouth. I think of how the change in my life is here now, with the plump baby cheeks, soft downy head, chattering toddler and busy, bustling husband. 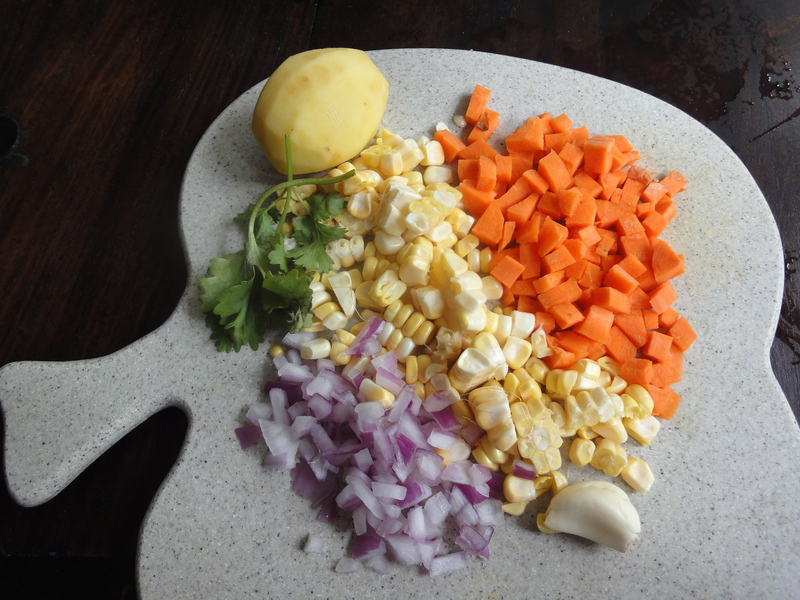 I throw all the chopped vegetables into a pot with a pat of butter (butter is a must), add 2-3 cups of water and bring to boil. Cook until the vegetables are soft, puree about half the soup in a blender. Add the puree back to the whole pieces in the pot, season with salt, garnish with chopped flat-leaf parsley or cilantro and serve. A little milk can be added for additional flavor, but it is not a must. And finally, yes, after all the musing, how I wouldn’t change any of it for anything in the world.